Chris Froome (Sky) has survived another day in the Giro d'Italia, helped by his teammates. The Briton is expecting to improve his performance at the upcoming Etna stage. The rider managed to arrive with the reduced pack at the end of the stage, maintaining a gap of 55 seconds with the race leader Rohan Dennis. "That was a lot more straightforward than yesterday’s stage but it was still quite tricky," said the rider at the end of the stage. "It sounded like there were a few crashes in the last 20-30km which shook things up a bit in the bunch. "The team were really good today and did a good job keeping me right up front without having to do too much work themselves. Hopefully, we’ve still got something left for tomorrow." The next stage of the race features a climbing finale on the Etna and promises to shake things up in the GC. 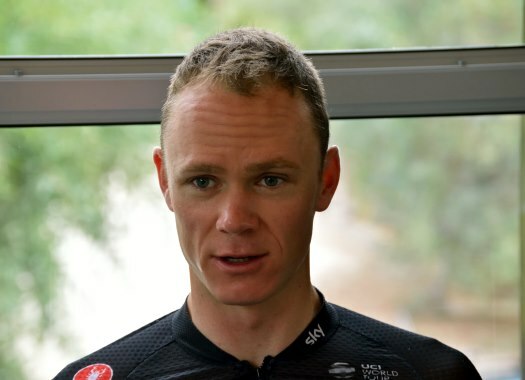 "Let’s see what happens (on Etna)," Froome commented. "There are a few different dynamics going on in the race at the moment. A lot of pure climbers who don’t really fancy their chances in the time trial against Dumoulin will be wanting to take time. "It’s the first big mountain stage of the Giro and it could be very explosive and very active towards the final. Last year was a pure block headwind so it wasn’t so active – but I think this year will be quite different. For me, I’m just hoping to get through the stage the best I can. Obviously, I’ve lost a bit of time already but I’d like to start improving on that."